CRES. E DIM. is back this season with a dreamy collection. Instead of showing at Seoul Fashion Week last season, CRES. E DIM put the spotlight on their secondary brand: DIM E. CRES by doing a presentation at Common Ground, a container shopping mall. This Spring/Summer 17 season, CRES. E DIM’s comeback takes centerstage. Their front row was a star-studded affair. All of the celebrities showed their support for designer HONGBUM KIM’s logomania creations, a feature closely related to the identity of DIM. E CRES. This time, it came down the catwalk in brightly printed text on staple hoodies and on the back of a jacket but with a strikeout. TLC’s No Scrubs and mixes from FKJ (French Kiwi Juice) set a chill atmosphere to the room. The concept was a dream. 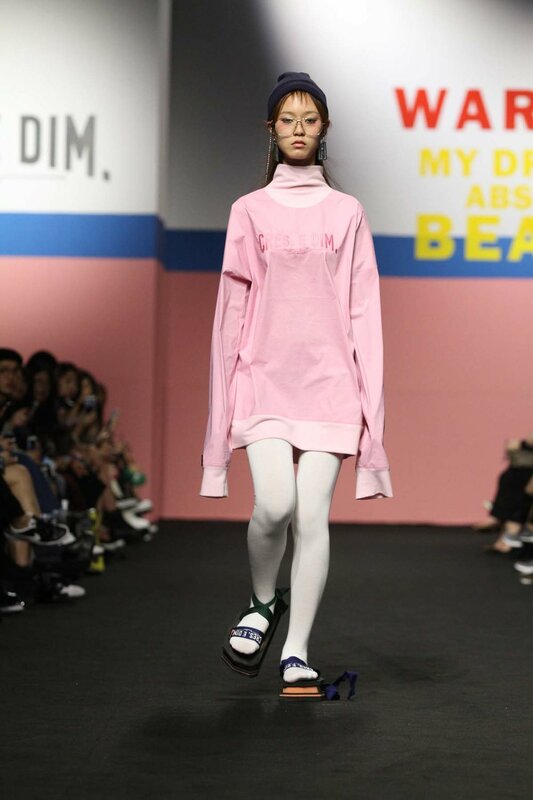 To be precise, it was a carefree dream with a majority of the collection being loungewear with hoodies coming down the runway in all colorways from pastel blue to pitch black. Details were specialized via little metal tags with the brands name on it, as well as printed wording like: my dreams. To spice things up, some sweaters featured carefully constructed holes at the back. And one model came down the runway in a duo-tone bodysuit paired with knee-high socks. The opening look was a brown set: a tan jacket and skirt with the model wearing a white beanie and walking in CRES. E DIM’s rendition of Geta Japanese sandals. There were two variations to their raised foam flatforms: one with the label’s name on the strap and another to be tied by ribbon. Elements of the 80’s could be seen in the transparent aviator sunglasses with a gold chain hanging around the model's neck — a must have for those that easily misplace their sunnies. They also drew inspiration from retro style windbreakers, turning it into a bodysuit. A trio of models came out together, wearing Wendy from Peter Pan’s nightgown dresses. In pink, green and blue silk, they quite closely resembled the Powerpuff Girls. All in all, this collection acted as a transition from accessible streetwear to a higher end designer statement. Want to see more? Enjoy our backstage gallery here.